When Cardinal Jorge Mario Bergoglio became the new Catholic pope in 2013, he chose the name of Francis to indicate that his pontificate would be one of mercy and compassion for the poor and needy—for such is the reputation of his eponym, Saint Francis of Assisi: “the man of poverty, the man of peace, the man who loves and protects creation,” explained Bergoglio, now Pope Francis, as to why he chose that name. St. Francis (1182-1226) is indeed known for all those qualities. But he was known for something else that his modern day namesake fails to live up to: unapologetically confronting Islam. Fully aware of the dangers, Francis was determined to go on a mission to the unbelievers of the Muslim nations. The primary sources are in agreement that he was now ready to sacrifice his life and die for Christ, so there can be little doubt that the intent of his journey was to preach the Gospel even at the risk of martyrdom (p. 43). Converting the Muslims by his preaching was the ultimate goal of Francis’ efforts, and a peaceful end to the war would be a consequence of their conversion. In the words of scholar Christoph Maier, “Francis, like the crusaders, wanted to liberate the holy places in Palestine from Muslim rule. What was different was his strategy…. He wanted their total submission to the Christian faith” (p. 63). The early documents are unanimous in agreeing that the two Franciscans were subjected to rough treatment upon crossing Muslim territory. The men of God were seized in a violent manner by the sentries, assaulted, and bound in chains. Celano reports that Francis “was captured by the Sultan’s soldiers, was insulted and beaten” yet showed no fear even when threatened with torture and death (p. 58). Francis then explained: “That is why it is just that Christians invade the land you inhabit, for you blaspheme the name of Christ and alienate everyone you can from His worship”—a reference to Islam’s dhimmi rules which, along with debilitating Christian worship, make Christian lives so burdensome and degrading that untold millions had converted to Islam over the centuries to ease their sufferings. There are more interesting aspects concerning St. Francis’ encounter with Sultan Kamil, including those that find parallels in the modern world, such as Sharia’s strict bans on blasphemy against Islam and evangelizing for Christianity (often seen as one and the same) and call for the execution of apostates from Islam. They are discussed in this brief article. 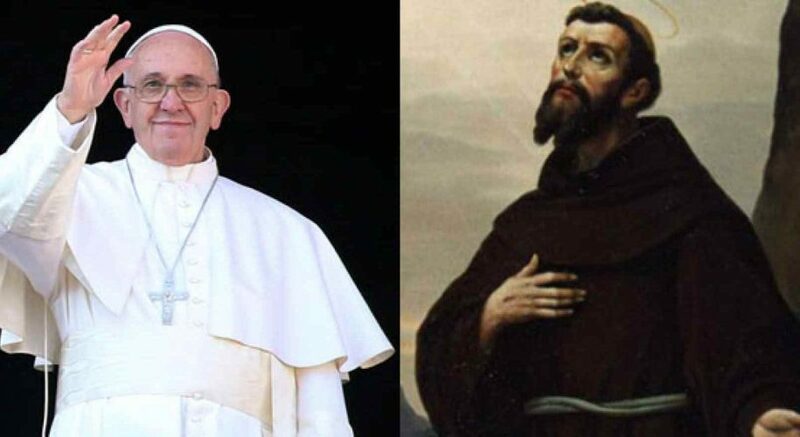 For now, consider some important differences between St. Francis and his modern day namesake, Pope Francis. While the saint accused Islam of persecuting Christians, and sought to bring them succor—to the point of putting his life on the line—Pope Francis refuses to confront Islam. When he has the attention of the world he habitually fails to condemn or even shed light on the nonstop Muslim persecution of Christians, including millions of Catholics. Last year he delivered a nearly hour long speech before the United Nations. Only once did Francis make reference to persecuted Christians—and he merged their sufferings in the very same sentence with the supposedly equal sufferings of “members of the majority religion,” that is, Sunni Muslims. In reality, of course, Sunnis are not being slaughtered, beheaded, enslaved, and raped for their faith; are not having their mosques bombed and burned; are not being jailed or killed for apostasy, blasphemy, or proselytization. That’s because the terrorists—whether al-Qaeda, Boko Haram, or ISIS—are Sunnis. And before that Francis issued his first encyclical—an important document meant to be relayed to the world’s Catholics—with no mention of persecuted Christians. More recently, after a journalist asked Pope Francis about the slaughter of an 85-year-old priest in France, and how he was clearly “killed in the name of Islam,” the pope disagreed and proceeded to offer a plethora of absurd and silly rationalizations in defense of Islam. A foremost expert on Francis and the Fifth Crusade, Professor James Powell, wrote: “Francis of Assisi went to Damietta [Egypt, where Sultan Kamil was] on a mission of peace. There can be no question about this. We should not however try to make him a pacifist or to label him as a critic of the crusade.” Another leading crusade scholar, Christoph Maier, was even more explicit: “Francis thus accepted the crusade as both legitimate and ordained by God, and he was quite obviously not opposed to the use of violence when it came to the struggle between Christians and Muslims.” At one time Francis had remarked to his friars that “… paladins and valiant knights who were mighty in battle pursued the infidels even to death…” Francis admired the deeds of such brave men because “… the holy martyrs died fighting for the Faith of Christ” (p.70). In the context of confronting Islam, Rega laments that, “for the revisionists, the ‘real’ Francis was not a bold Evangelist, but a timid man, whose goal was to have the friars live passively among the Saracens [Muslims] and “to be subject to them” (p.95). A final important point: while St. Francis did not mock Muhammad—though apparently not enough to dissuade the pious from calling for his head—he unequivocally portrayed the Muslim prophet’s message as false. Unlike the diplomatic Pope Francis, who never seems to preach Christ to Muslims but rather confirms them in and validates their religion, the sincere saint was actually more concerned with the souls of Muslims, to the point of putting his own life on the line. This used to be one of the chief concerns of all popes, the “Vicars of Christ.” But apparently not for Pope Francis. In short, there’s a fine line between St. Francis’ compassion and Pope Francis’ cowardice—or worse, complicity. When it comes to confronting Islam and standing up for the faith and persecuted Christians, Pope Francis woefully fails to live up to the brave monk whose name he appropriated.